Obama now leads McCain 50%-43% overall, up from 46%-41% before the parties' conventions a month ago. Obama's support is not just broader but sturdier; 23% of McCain supporters said they might change their mind, while only 15% of Obama's said they could be persuaded to switch. Among the poll's most dramatic findings: McCain is losing female voters faster than Sarah Palin attracted them after the Republican National Convention. 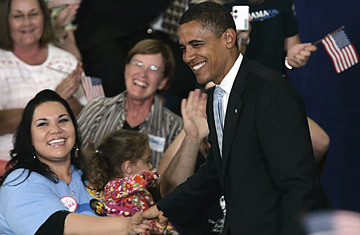 Obama leads McCain by 17 points with women, 55%-38%. Before the conventions, women preferred Obama by a margin of 10 points, 49%-39%. After McCain picked Palin as his running mate, the gap narrowed to a virtual tie, with Obama holding a 1-point margin, 48%-47%. In a stark indication of just how much the political landscape has changed over the past four years, white women now favor Obama by three points, 48%-45%; in 2004, George W. Bush won the same demographic by 11 points against John Kerry. Where Bush carried married women by 15 points in that election, 57%-42%, Obama now leads by 6 points, 50%-44%, a 21-point shift. Non-college-educated white women split virtually evenly, 46%-45% for McCain. By contrast, Obama remains weak among white men. That group supports McCain 57%-36% overall, and non-college-educated white men back the Republican ticket by an even greater margin, 63%-27%. Bush himself fares terribly in the poll. His approval rating is 23%, the lowest number ever found by Abt/SRBI, the company that conducted the poll for TIME; 73% of respondents disapprove of his performance as President. Only 26% approve of his handling of the current financial crisis. The economy was a key driver behind all the new numbers. Sixty-five percent of respondents said their economic situation has worsened in the past year  and of those, 59% support Obama. Overall, voters give Obama a 45%-37% edge over McCain as the candidate who is better equipped to handle the economic crisis. The TIME poll shows that Obama gained some support after his performance at the presidential debate last Friday. Twenty-three percent of those who watched it said it made them more likely to vote for Obama, while 16% said they were more likely to vote for McCain. Of the 73% of likely voters who watched the debate, 41% thought Obama won, while 27% thought McCain did. For McCain, the most troubling sign may come not from the details of the poll, which are grim for Republicans, but from the historical context. No Democrat has crossed the 50% threshold in the general election since before Ronald Reagan was elected, let alone do so a month before the election. The fact that Obama's numbers are at this level after a bruising year of attacks from McCain and Hillary Clinton appears to validate his strategy of nurturing and protecting his "character" points. The poll found that Obama maintains a 60% favorable rating among all voters, and 61% think his election would restore a sense of hope and inspiration to the U.S.
Obama still shows vulnerability on the question of what kind of President he would be. Fifty percent of those polled said Obama gives a great speech but doesn't have other qualifications; 46% disagreed with that statement. Asked if it was accurate to say that the real Barack Obama holds extreme positions that won't be revealed until after he's elected, surveyed voters split 46%-46%. The poll, which surveyed 1,133 likely voters nationwide between Sept. 26-29, has a margin of error of +/- 3 percentage points.